It might have been a long time since you pictured yourself starting your own ice cream business, or you might be looking for just the right opportunity to take the plunge. If so, a trip to St. Louis might be in order. In the shadow of the Gateway Arch, the Frozen Dessert Institute is giving students a three-day course in every aspect of the commercial ice cream industry. The classes take place in a local ice cream shop that remains closed to the public during the day to accommodate the school. These students return home having made new friends; learned about every imaginable variety of ice cream, yogurt, and sorbet; and received tons of information on just how to get their dream jump-started. The root of any successful ice cream business is good ice cream, and the Institute gives students plenty of exposure to the techniques that make ice cream, gelato, sorbet, and other frozen treats delicious. Frozen yogurt is one of the most important items that the students learn to make, as health-conscious snackers all over the country look for a low-fat alternative to ice cream. In addition to making their own ice cream during class time, the students also have the opportunity to try out some of the other great ice cream shops in the St. Louis area, comparing notes and making plans for their own offerings. 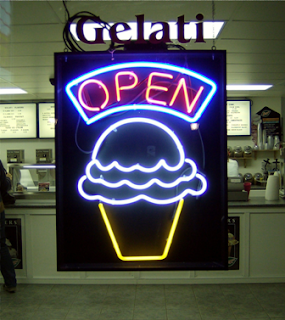 Even the best ice cream won’t sell, however, if the shop owners aren’t ready to manage their business. When they’re not mixing up batches of ice cream, the students learn from experts about getting their ice cream business funded, off the ground, and in front of potential customers. All of the folks at this school are very serious about their plans, and each person has his or her own story that has led them to this important moment in their career. If you have an interest in starting an ice cream shop or buying an ice cream truck, the best way to begin is to develop a solid icecream business plan. Our website has the perfect tool for this—an easy-to-use piece of software that allows you to customize the plan to your specific circumstances and resources. Once you have everything in place, maybe you’ll be ready to head off to St. Louis for a session at the Frozen Dessert Institute. At three days long and $895.00 for tuition, it’s an experience that the students will never forget!